← Why is it top performers demand coaching? As in life, at the core of every business is a heart beating away providing life giving oxygen, paying salaries, keeping production moving and supporting the families of every person involved. This heartbeat pumps something which, like our own heart pumping oxygen, can kill your business faster than any other business problem. This essential oxygen for business in paying customers. No matter what business you are in, and this includes ‘not for profits’ and totally volunteer organisations, the life blood of every organisation is people willing to be engaged, to volunteer, to pay fees, and to buy products or services. I live and work in a large city. This involves travelling in and out every day. I take a keen interest in traffic reports as I know it takes just a small accident to create a major blockage on the roads. Manufacturing companies wait on deliveries to meet the demands for production; Events wait on patrons to turn up; Buildings wait on maintenance companies to fix the elevators … the list goes on. The average person waits until they feel the symptoms until they do something about the pain of a heart problem – and if you are a male you are likely to wait until it is too late. Is Selling a ‘Black Art’ or Normal? Selling is often termed the ‘Black Art’. Something necessary to make a business work, yet mysterious in nature. Somehow the sales wizards go out and bring in orders. An inventor I have worked with keeps telling me “If you build it they will come“. Know your story. Keep it simple and do not leave things out just because you think it has all been said before. For this new person it is the first time and it is important they get the full impact. Like an actor playing the same show every day – keep the passion alive and your audience will applauded every performance. This entry was posted in Monday Motivational Minute and tagged blockages, heartbeat, sales. Bookmark the permalink. 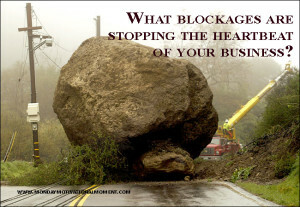 One Response to What blockages are stopping the heartbeat of your business?